Today I found out that Cheerios used to be called CheeriOats. Cereal has become such a go-to food for breakfast for children and adults alike that it’s difficult to think that it hasn’t always been around. In the grand scheme of things, cereal is a relatively modern invention. Cheerios entered the cereal playing field a bit late, and they weren’t always called Cheerios. During the Civil War, many Americans were suffering from dyspepsia, or indigestion, likely caused by a high protein diet largely composed of fatty meats and not nearly enough fibre. Symptoms included upper abdominal pain and bloating. At the time, doctors decided the American populace needed to be taught better eating habits and established institutions called sanitariums in order to emphasize a better diet and a more active life style. Dr. James Caleb Jackson founded the Jackson Sanitarium in New York. He was one of the first to mix water with whole wheat graham flour, resulting in a breakfast cereal he called “Granula.” Though the cereal had to be soaked in milk overnight to be palatable, the idea of cereal caught on. In 1866, Ellen White created the Western Health Reform Institute in Battle Creek, Michigan, where she paired up with John Harvey Kellogg to come up with a way to make cereal more widely available. John Kellogg and his brother Will came up with the first “flake” cereal that were originally called “Granose Flakes,” which were made available in 1896. Later, Will went on to found the Battle Creek Toasted Corn Flake Company, which went on to become the Kellogg Company known for its many cereals today. Also in Battle Creek, a way to puff rice was discovered by Alexander Anderson. Quaker Oats went on to introduce puffed rice cereal to the markets in 1905. By the early 1900s, cereal companies had wheat, corn, and rice covered, but a cereal with an oat base had yet to break through the market. Thus, in 1941, CheeriOats were introduced as a “ready-to-eat” oat cereal. The name emphasized the main ingredient to differentiate itself from the numerous other brands out there. Unfortunately for CheeriOats, Quaker Oats took offense to the name, claiming the “Oats” part infringed on their trademark. While it is highly unlikely Quaker Oats would have won in court, to avoid the issue altogether, the name was changed to Cheerios in 1945 to avoid further dispute. As to the shape, which ultimately inspired the second half of the updated name, about ten different shapes and sizes were considered for Cheerios before the creators settled on the small “o” shape, which they achieve via a special design of a “puffing gun”. Cheerio dough is heated and shot out of this gun at hundreds of miles per hour, making the dough puff and resulting in the “o” shape. 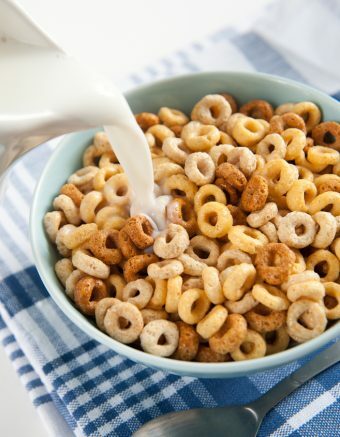 By 1951 Cheerios was the top-selling cold cereal sold by General Mills. Today, Cheerios continue to dominate the cereal market with about one eighth of all cereal box sales in the United States being Cheerios. Someone calculated the number of Cheerios it would take to circle the Earth at the equator. The answer? 3,155,524,416. From the 1960s, Cheerios has been marketed toward children with a variety of toys sealed in each box. It also advertised itself with a series of commercials featuring cartoon characters such as Bullwinkle, Hoppity Hooper, the Peanuts gang, and creations of Cheerios’ own making: The Cheerio Kid and his girlfriend Sue. The Kid and Sue were often featured in clips getting into trouble, eating Cheerios, and undergoing a buff transformation to get themselves out of trouble—kind of like Popeye and spinach. While the immediate health benefits of Cheerios were exaggerated in such instances, the cereal is certainly a healthy alternative to many breakfast cereals sold in stores today. In 1971, oats were promoted as the grain that was highest in protein, bringing more attention to whole grains, oats, and the cereal that offered both, Cheerios. Today, Cheerios claim to help lower “bad” cholesterol. 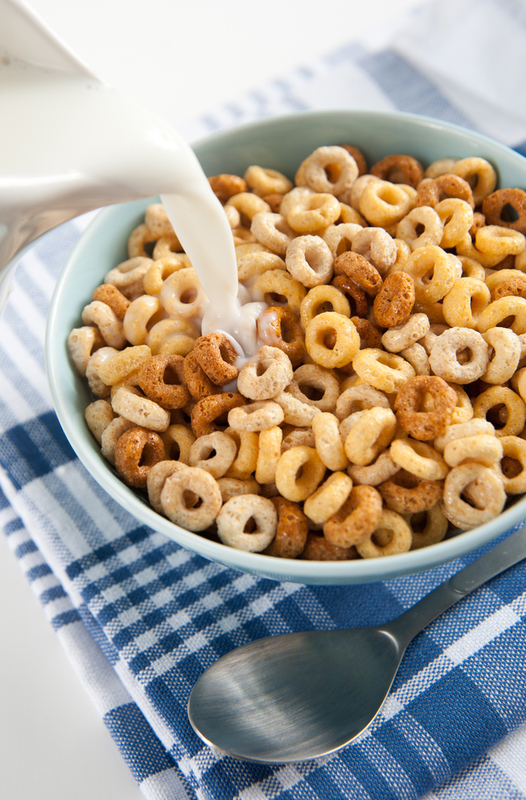 The “original” Cheerios also contain only one gram of sugar per serving, compared to other leading names, like Fruit Loops (12 grams) and Lucky Charms (10 grams). In 1979, Cheerios introduced “Honey Nut Cheerios,” the first of a long line of different flavours of the favourite oat-laden breakfast cereal. Honey Nut Cheerios also saw the introduction of “BuzzBee,” the bee character that appears on every box. Buzz was named after a nationwide naming contest was conducted for children ages 5-12 in 2000. Other flavours of Cheerios recently released include Berry Burst, Banana Nut, Chocolate, and “Fruity” (which look a lot like Fruit Loops, but are Cheerios sweetened with fruit juices). As you can probably guess, the different flavours add more sugar to each serving, deviating from the product’s healthy roots. In May 2013, Cheerios posted a controversial ad on YouTube featuring a biracial family. The video received so many negative comments about being “racist”, according to the commenters, and “not the American norm” that comments for the video were shut down. However, since then the video has received a huge amount of support. One family created a website called “We Are the 15 Percent” which calls for photo submissions of biracial families. The goal is to see more representation of interracial couples and their families in mainstream culture. In the first year that Cheerios appeared in stores, General Mills sold 1.8 million cases of the cereal, with each case containing twelve boxes. That’s a lot of Cheerios! I remember eating Cherrioats when I was 3&4 years old, and I remember when they changed the name to Cherios when I was 5 . I would LOVE to see a picture Of the original Cherrioats box!